1 MALAYSIA Development Bhd (1MDB), whose chairman was Tan Sri Mohd Irwan Serigar Abdullah, had lied about the source of the US$1.2 billion that it used to pay Abu Dhabi’s International Petroleum Investment Company (IPIC) in 2017. It made two payments of US$602.7 million each in August and December last year as part of the contentious settlement with IPIC, and each time, 1MDB had issued statements to say that “all funds were paid from proceeds of the ongoing rationalisation programme”. Critics such as parliamentarian Tony Pua had asked 1MDB to disclose details of where the money had come from but 1MDB refused to go beyond saying it came from the monetisation of its assets. Pua, who is now political secretary to Finance Minister Lim Guan Eng, was right that the money came from taxpayers. 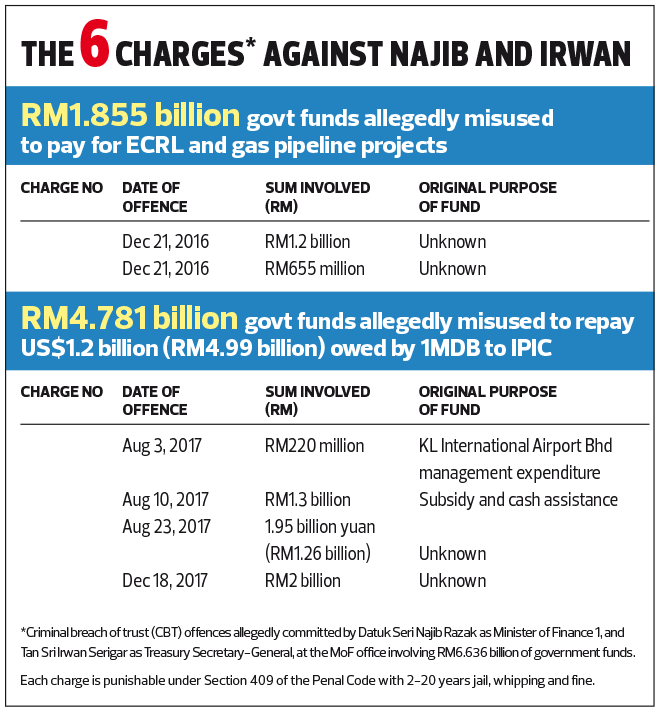 Irwan and his then boss Datuk Seri Najib Razak were jointly charged last week for using government funds totalling RM6.63 billion, meant for other uses, to pay IPIC RM4.78 billion and another RM1.85 billion for the East Coast Rail Line (ECRL) gas pipeline projects carried out by contractors from China. Irwan was also secretary-general of MoF, while Najib was prime minister and finance minister. Both Najib and his lawyer Tan Sri Muhammad Shafee did not deny that money from the government’s Consolidated Fund was diverted to pay IPIC on behalf of 1MDB. They, however, justified that it was done to “save the country” as not paying IPIC could have triggered a default of bond payments by 1MDB. But why did Najib and Irwan lie that the money came from 1MDB? Among the sources of the money was RM1.3 billion that was meant for the BR1M cash handout programme and another RM220 million meant for the Kuala Lumpur International Airport. It is learnt that the source of the RM2.0 billion stated in the sixth charge was from the sale of land to Bank Negara Malaysia last December. This controversial purchase by the central bank is believed to be why its then governor Tan Sri Muhammad Ibrahim lost his job after the change of government in May. Malaysia and Abu Dhabi were locked in a dispute over US$3.5 billion that 1MDB said was paid to a unit of IPIC — Aabar Investments — between 2012 and 2014. The matter surfaced in May 2015 when 1MDB was floundering and was not able to service its debts. IPIC entered into a one-year debt-swap agreement with 1MDB whereby IPIC would provide US$1.2 billion in financing to 1MDB, including US$200 million to service interest on bonds that were co-guaranteed with IPIC. On April 11, 2016, responding to news reports that Aabar had received payments from 1MDB, IPIC released a statement to the London Stock Exchange that Aabar BVI, to which 1MDB had paid the money, was not part of its corporate group and that it had not received any 1MDB money via Aabar BVI. In June 2016, IPIC filed its consolidated financial statements for the year ending Dec 31, 2015, with the London Stock Exchange. In those financial statements, IPIC indicated that it “understands that other companies outside the group’s corporate structure were incorporated in other offshore jurisdictions using variations of the ‘Aabar’ name. The group is investigating these entities further”. IPIC reiterated that neither it nor Aabar were affiliated with, or received payments from, Aabar BVI. IPIC also indicated that after 1MDB defaulted on two interest payments due under the 2012 notes in the first half of 2016, IPIC made interest payments totalling US$103 million on 1MDB’s behalf “pursuant to its obligations in respect of the guarantees”. The saga started in 2012 when a total of US$3.5 billion, from two US$1.75 billion 1MDB bonds arranged by Goldman Sachs, was alleged to have been stolen and laundered via Aabar BVI, which has the same name as a company owned by IPIC. IPIC has said that it did not own Aabar BVI, although two shareholders — Khadem Abdullah Al Qubaisi and Mohamed Ahmed Badawy Al Husseiny — were also directors of the real Aabar. 1MDB had in 2012 transferred US$1.367 billion to Aabar BVI as a security deposit for the co-guarantee that IPIC provided for the issue of the bonds. September and December, 2014: US$855 million and US$295 million as “top up of security deposits”. November 2014: US$993 million to terminate options that were granted to Aabar to acquire a stake in the listing of power assets owned by 1MDB. In total, 1MDB paid US$3.5 billion to Aabar BVI between 2012 and 2014. The position of Malaysia and 1MDB has been that been that the US$3.5 billion was “legitimately” paid to IPIC/Aabar, which then obliges IPIC/Aabar to fulfil its obligations as a co-guarantor for the bonds. IPIC/Aabar insisted that they did not receive the money and therefore there was no obligation for them to guarantee anything. 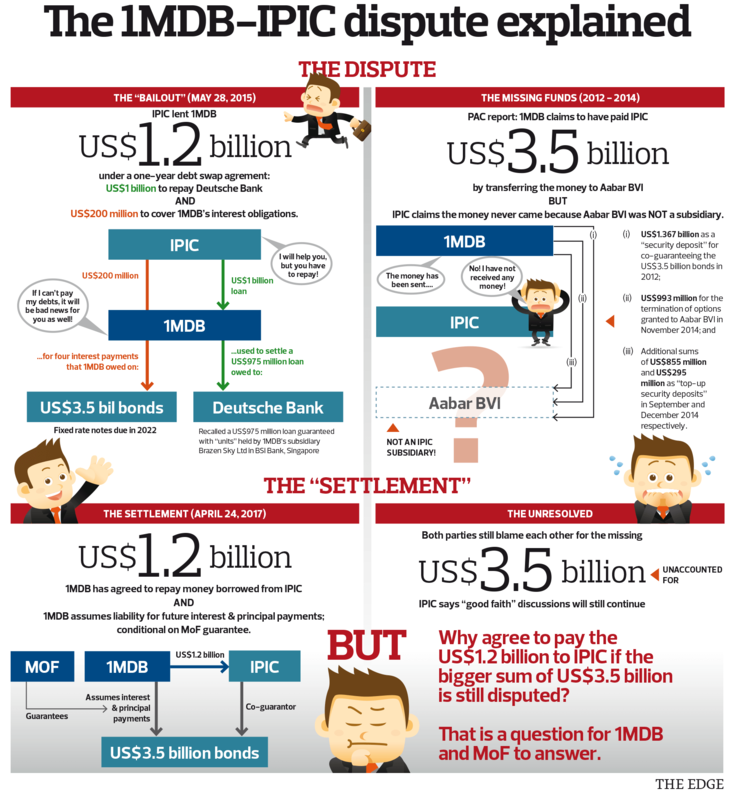 Then, in a surprising turn of events, on April 24, 2017, Malaysia entered into a settlement agreement with IPIC in which Malaysia agreed to pay back the US$1.2 billion it owed to IPIC and, more significantly, the MoF gave an undertaking that 1MDB would fulfil all future payments of interest and principal sums related to the bonds. In short, Malaysia agreed to free IPIC of its obligations as a guarantor, for which US$3.5 billion was paid by 1MDB between 2012 and 2014. This decision by the then government led by Najib was a shock because it appears to mean that Malaysia had given up on claiming back the US$3.5 billion that it had earlier insisted was legitimately paid by 1MDB to IPIC/Aabar.